With the number of hours that I have to work every week and the responsibilities I have to balance between work and family, I never have time to keep fit. I will not lie, it has been ages before I hit the gym. And even when I did, it was only for a short while before I embarked on my entrepreneurial journey which skyrocketed almost instantly, needing my undivided attention almost immediately. Now, while I cannot complain nor do anything differently if I could go back in time..
... I still find myself entertaining the images of my fit self - being able to run a mile without heaving and feeling as though my lungs are burning and looking for the right time to burst out of my chest. The problem is, my schedule and responsibilities are not about to change anytime soon. So I had to look for an alternative to hitting the gym. So one late night, after having family time, playing with the kids and tucking them in, I sat at my laptop desk and started researching options that could help me achieve my fitness goals. The whole idea was to get home workout equipment. I must say, at the point of typing in the keywords on Google; I didn't anticipate to be bombarded with so many related results. As it turns out, home exercise equipment are numerous and diverse. There are all kinds of workout machines built for home use. Your best option will, however, depend on your needs and preferences as well as some of the features and technologies that the machine in question sports. That said, I loved the Concept 2 Rower workout machine and is what I shall review today. I am tempted to say that it was love at first sight. And sure to its advertisements and marketing, the product has not let me down. As a matter of fact, looking back at the reviews I read before my decision to purchase it, they left out a lot of juicy details of the ability of this machine. But before we start on the review, here is a short introduction. The Concept 2 Model D is one of the very best indoor rowing machines available on the market. This says a lot of its ability and qualities given that it stands out from a sea of rowing machines. The machine stands out for its perfect combination of unlimited resistance, durability and engaging programming all at a fair price point. This air rower is the same that professionals at the Olympics use to work out and train. In addition to being a home workout machine, most gyms also have it as well. I should mention that this rowing machine is not the cheapest available on the market. The technology provides a realistic feel while rowing will come at a price. But considering all that it has to offer, and its efficiency of burning calories, the price is quite fair. The Concept 2 Model features a performance LCD monitor. The LCD screen is perfect for managing the advanced functions that help to control the workout while you are rowing. As soon as you start to row, the display turns on and starts keeping track of your progress and performance. The monitor will track your distance, speed, calories burnt and your pace. Also, since I have a heart rate monitor installed, it tracks my heart rate as well. In addition to this, and complimenting this feature, the Concept 2 Rower can recharge its batteries while you work out. This gives a major boost to the longevity of the batteries. This is to say that in addition to helping you get in shape, the efforts poured out on the machine are put into good use. It makes it feel like trying to hit a new game high score while playing your favorite smartphone game. And as if that is not enough, the machine comes with a removable LogCard that allows the storage of data on your computer or laptop. This is a neat feature that lets you keep track of your data from your workouts and those of other 5 different users as well. As earlier stated, this workout machine is an air resistance rower. The resistance comes from the spinning flywheel that has fan blades attached to it. When you pull the handle of the rower, the fan blades kick into spinning action creating the wind. The higher the wind created, the harder it is to pull on the handle. Simply put, the level of resistance you will experience will greatly depend on how hard you will row. Overall, the air resistance technology is preferred even by Olympic professionals. As a matter of fact, most athletes use it for their off water training since it is more realistic with regards to the resistance created and it provides accurate data. But even while this workout machine features variable resistance courtesy of the air resistance technology it employs, you can still adjust the rowing feeling by making adjustments to the damper settings. The damper settings can be adjusted from levels 1-10. Now, you probably are thinking that these levels affect the resistance of the machine. I can’t blame you since this was my thinking as well until I came across a piece explaining this feature. There is a lot of technical jargon that goes into the explanation, but I will keep it simple and precise and put it like this; the levels represent the amount of air going into the flywheel which affects the feel of the rowing. The effect is similar to that of gears on a bike. Different settings provide you with varying feels while working out. Air technology resistance - the fact that the resistance of the rowing machine varies depending on the effort input, means that rowing harder will yield higher resistance. The overall effect is an automatic resistance. This is beneficial since you will not have to keep stopping your workout to make adjustments to the resistance levels. Data tracking options – true, the goal is to gain overall fitness. You will, however, be doing it all wrong if you do not keep track of your progress. Keeping track of achievement will help you know whether you need to increase or reduce the resistance or increase the workout time or not. Also, these data tracking options also include varying inbuilt Rowing games and preprogrammed exercise sets to get you going. This is perfect for those who have never been to the gym. The rower has quite a large footprint for indoor workout equipment. It measures 96 inches and 24 inches wide. 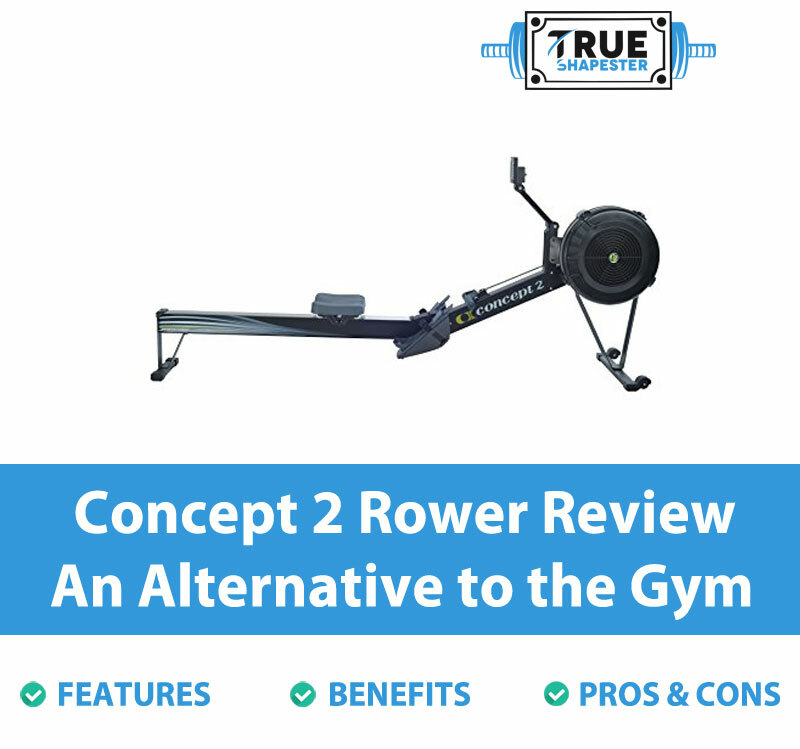 With all that the Concept 2 has to offer, being a great air rower and all and the fact that I have used it for about 6 months now, I can comfortably say that this product will not disappoint. And true to its marketing, it is indeed one of the best, if not the best rowers available on the market. It is perfect for Olympic athletes, the experienced and beginners as well. Also, the model is long lasting given its durable design and construction. While the Concept 2 Rower has been designed for home use, complete with rubberized supports, it still is important to provide your home floors with additional protection. This P.V.C mat gives you just that. This P.V.C is tough to protect your floors from damage as you row away on the machine. The surface is non-slip ensuring that the machine stays in one place. Besides to providing protection, the product also helps in reducing the noise produced as it dampens the vibrations generated during the workout. The mat measures 3 feet by 8.5 feet. The chain is durable, and nickel plated to add to its longevity. But even with this material used in its construction, the chain needs some bit of maintenance. For this, this machine chain oil comes in handy. The product is packaged in a 4-ounce bottle and features clear labeling as well as instructions on using the product. The oil helps to protect your investment, to prolong the life of the rower and reduce the noise. It works perfectly on the D rower as well as A, B, C and E concept rowers. The Concept 2 features a set that has an ergonomic design with curves all in the right places to accommodate you comfortably. However, the seat after some time gets uncomfortable due to its hard nature. This seat cushion will solve this problem. The product has a thick memory foam measuring 2 inches thick and is perfectly comfortable. The surface is non-slip, and the cover is machine washable to help you keep it clean at all times. From the sea of rowing machines available on the market, the Concept 2 model D rower stands out like a sore thumb. The durability, design, and construction are of high quality which gives it an edge over all other machines. The fact that Olympic athletes trust it gives it even more trustworthiness. I have used this workout machine and can vouch for it without a doubt. If you are in the search for the best rowing machine, look no further than the Concept 2.